U.S. Neiman Marcus online is having an amazing sale which is available during these days! Check out details below. 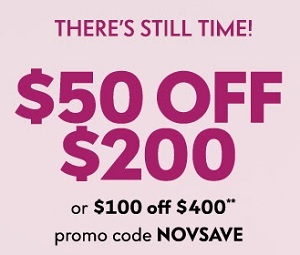 Spend $200 or more and take $50 off your purchase. Or, spend $400 or more and take $100 off your purchase. Source of the information is Neiman Marcus. Offer is valid until November 8, 2017, online only. For more details about the offer visit U.S. Neiman Marcus online.